Of all the Thamesside pubs, this one is the most special, the most atmospheric, the most tucked-away – and its wooden deck at the back has probably the best view of the river too. If there’s a better accompaniment to an evening pint than the sound of the river slapping away through the slats under your feet, and the lights of the City twinkling away in the distance, we’ve yet to find it. Inside is brilliant too – it dates back to 1620, with ecclesiastical wooden pews, real ales, an open fire and a friendly hubbub of chatter. A real find of a pub. The Mayflower is a traditional, typically English pub and restaurant boasting a great view over the Thames from the outside, decked jetty. The building is the oldest pub you'll find in London on the Thames. It's full of history and the original mooring point of The Pilgrim Fathers' Mayflower ship. was there on Saturday before the winter wonderland. nice cosy atmosphere (to combat the awful weather outside) and a great range of craft beers. food was very good and there was no problem with my kids being in the pub even though they were quite busy. Love this pub, it's small, quaint, steeped in history and complete with a decked jetty outside where you can sit and drink (or eat) whilst staring dreamily out to the river. I love the decor here and the atmosphere is always great, it's a must visit! If you're after character, this pub has bucketloads of it. There's an eccentric nautical theme running throughout, with ropes and other ship-related decorations. The pub's furnishings and plaques exude history. And it's eminently cosy, especially with the open fire, the dim lighting, and the blankets on offer. The one small drawback is that prices are on the high side. I stumbled upon this pub on the way to another event I had booked in the area and due to the amazingness of this pub I nearly didn't go! 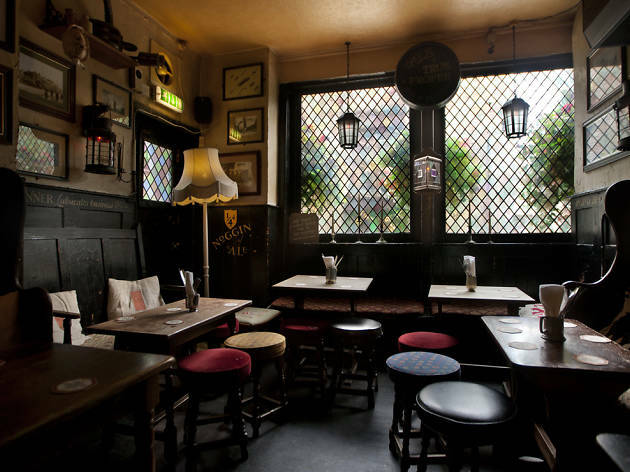 I'm always on the hunt for old, historical,traditional pubs in London and The Mayflower has to be up there with the best of them. You are made to feel welcome instantly, the atmosphere, staff and drinks all create a very homely vibe. I was lucky enough to get there late afternoon in the week so managed to grab one of the snug booths. Nestled down with a good book and a pint was pure perfection. I will be back to try the cheese board which goes up to 11 cheeses and half a carafe of port. The Mayflower pub is pretty much the number 1 attraction in the Rotherhithe area. It's an old pub and inside is dark and a tad cramped space wise as is expected in quaint old pubs. It has a pub with an outdoor terrace overlooking the Thames downstairs and a superset restaurant area upstairs. I took my mum and partner here for a Sunday roast treat recently and we were not disappointed. The food was amazing and the portion size was immense. You definitely get your money's worth. Unfortunately it meant I was too full to try a dessert but I'll definitely be back for round 2. This pub is well worth a visit for the food alone. Note that on Sundays it's worth reserving yourself a table as it seems to get pretty busy. THIS, see, THIS is why we come to live in London! The Mayflower has an excellent selection of ales and an extensive pub menu that keeps you in the spirit of the times - once you enter this dark, barely-lit pub with so little space you're bound to rub up against a bunch of international students having their first London catch-up, you sort of forget what year it is. In the haze of candle light, warming pies and a lovely, bit more spacious outside deck that is especially nice in the summer, you can spend hours in here without feeling the need to check your watch. With friendly staff, lovely food and a true London feel, could you ask for anything more? Heard about this pub for a long time and finally managed to try it out. This place is a few mins walk from Rotherhithe station, fairly easy to locate. Love the way the pub looks due to its old English charm. The moment we stepped in, we were welcomed by friendly waiter/waitress and we even got to try the beers before we place our order. Food, drink, setting, staff... all good or very good. Gets too busy weekends though..because of the above..!! Please don't rush to go as it's my favourite pub except I don't like their beer selection. Wander down any street in London and among the blue plaques, the cobbled stones and the Oliver Twist architecture, you’re guaranteed to find a pub claiming to be one of the oldest & most historical taverns in town. Except there’s a good chance it’s actually not and if you’re new to the city, either as a guide-book toting tourist or a hesitantly exploring inhabitant, how are you supposed to know? How are you supposed to spot the truly awesome & genuinely ancient places out of the ocean of dross that’s littered with Wetherspoons’ but little else of note? Easy. You read my words, you heed my advice, you (metaphorically because we’ve only just met) take my hand and you go to the Mayflower. Tripping the light fantastic in Rotherhithe might not have been on your list of things to do this weekend but if it’s history, location & good food all washed down with a flagon of mead that you’re after, it’s exactly what you need to do because it’s in this south London area that you’ll find the Mayflower, the oldest pub on the Thames. Yielding some of the best views in the city from the original docking spot of the Pilgrim Father’s Mayflower ship, this place is everything you could want from something answering to the title ‘pub’. It’s small, dark & cosy but it’s also warm, clean & well-cared for. Curved and uneven steps that lead up to a first floor dining room that is often fully booked at the weekends; scarred but polished tables that are always packed but with the sort of people who will happily scooch over for you; an outdoor deck that’s equally brilliant whether you’re under sunglasses or a complimentary blanket…all these things make it the sort of pub the movie industry repeatedly tries & repeatedly fails to get right in big-screen incantations. No Hollywood, putting Ray Winstone in a bar does not an authentic British pub make. I hate an oxymoron but I’m trotting one out now when I say that Sunday lunches here a little bit epic. The roast beef is applause worthy is both value & flavour; folds of soft, pink, gravy splashed beef nestle alongside crunchy potatoes and a fiery wallop of horseradish, all of which are sheltered by a golden Yorkshire pudding big enough to require its own post code. Puddings are as brazen in their Britishness as Carry On films, a steadfast need to apologise and an unflagging adoration of tea; the sticky toffee pudding is particularly worthy of the extra notch you’ll have to claw out of your belt afterwards. A constant rotation of guest beers and ales will make it popular with craft & traditional beer lovers alike and staff are happy to share their tips for the best tipple and keen to make sure you have a great time doing so. The day we went was cold & frosty outside but inside, the feeling was as warm & welcoming as your own front door on a dark November night. 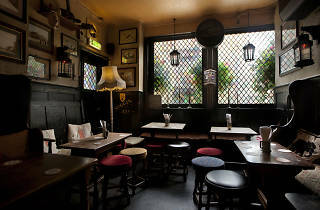 Whether you’re here for a week and looking to experience something that’s vintage in the true, non-chintzy-teacup meaning of the word or you’re here for good and about to start calling London home, putting this gem of a pub on your to-do list and then actually doing it, is simply something you mustn’t neglect to do. A gem of a pub! This historic pub was built nearly 400 years ago, but still stands proudly. As soon as you step in you get this old pub vibe which I love: wood everywhere, a little wonky, a little creaky… Great ambiance. But if you prefer you can sit on the terrace, built directly above the Thames, that’s a great option too. And needless to say the views are breath-taking. Beware - it can be a bit packed on weekends. Lovely atmosphere, good range of beers, large portions of delicious homemade food, waterside terrace- beware of very high tides: the passing boats' wakes can cause a splash through the floorboards! Like at Home. Fresh food, good pints and amazing views! Cosy in winter by the open fire, and fantastic in summer on the outside deck above the river. My new favourite pub in London! Been here a few times recently and it never disappoints. The deck at the back is lovely, nice to sit out and watch the boats go past on the Thames. The food is good and reasonably priced and it's great that they do a good selection of beers as well. In terms of atmosphere this has to be one of London's finest pubs. But that atmosphere, along with the riverside location, comes for a price – the drinks aren't particularly cheap. I had been living locally for 1.5 years before I got down to the esteemed Mayflower. I had heard lots about it, but didn't much believe the hype and couldn't be bothered to brave that long 20 minute walk there (nawt). It's nothing like I imagined. For some reason I thought it would be a new-ish, quay style building. It's actually really old, and really lovely. Quirky little paintings, stag heads on the wall.... my kind of place. I love the atmosphere here, and it is very warm and good for winter. Also an outdoor area with heaters which I'm sure would be lovely in the Summer. We ate here - couple of comments - it's pretty hearty pub food, so don't go expecting anything else. We had calamari (which was v greasy- avoid) and then burgers- that were tasty. Drinks were good and staff were friendly. I've been back multiple times since and I'm a bit of a regular. Fun, busy vibes on a weekend evening. New owner took over 3 years ago and completely transformed the menu, ambience and overall experience of the place. It's simply the best kept secret in London and it's my local! Staff are really laid back and freindly, there's no pretentiousness here - they think it's a great pub too! My favourite pub in London!! I always bring my friend and family or anyone who doesn't know it!! I advice to take the special, the pie is amazing!! the beer reel beer (Ale) and the staff great and cheerful. The terrace is the best spot during a warm evening even if you need to come early as it is very crowded!! Nice crowd. Ate LAMB char grilled with salad. The lamb was extremely rubbery. I mentioned this to bar staff and the the waiters but not even an apology! So pls don't order the lamb which was red inside and doesn't settle well in the stomach. Staff not helpful. Not recommended. Went December 2011 for my birthday. Went last night for my partners birthday. Both times experienced terrible service. Last night the food was terrible. I paid £16.99 for a fillet steak, waited about an hour after finishing the starter before the steak arrived, I had ordered it rare, so it was hard to ruin, but they managed. It was so dry, it had obviously been reheated, the chips were dry too. Plate presentation did not exist. Utterly terrible, it was low quality pub grub, charging gastro pub prices. I will never eat there again, unless I hear that the management and chef have both changed.